If you love the Powerpuff Girls then you should have a look at this I Heart The Powerpuff Gisl wall clock. The clock is lightblue and is square (also availible round) and meassures 10.75 x 10.75 inch and runs on one AA battery. On the clock you see I and a Heart and the Powerpuff Girls logo and in the heart you can see Blossom, Bubbles and Buttercup. Why would you get a boring plain clock when you can have one that looks way more fun and works just a good and maybe even better as it runs on Powerpuff Girls power. 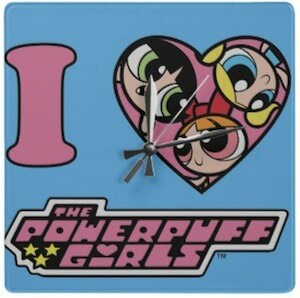 Come and have a closer look at this I Heart Powerpuff Girls Wall Clock.